It is that crazy time of year again in Jackson Hole when the temperatures drop below freezing and the snow begins to fall out of the sky. There is a buzz of energy in the air. Some locals are hustling to get the last bit of their firewood chopped and stacked and others are dusting off their ski and snowboard gear. Somehow November flies by like a dream that I can almost recall. It is vivid, but happens so fast that I can’t quite remember what happened. The next thing I know, I am once again slipping my feet into ski boots, clicking into my bindings, and it is winter. I am so excited to join Play Hard Give Back! It is an awesome way for me to give back to a cause that I believe in. I have chosen to support the Chris Anthony Youth Initiative. The concept is simple. Buy really great, healthy snacks and 20% of the proceeds go to the Chris Anthony Youth Initiative. Check it out! Anthony went on to a successful career as a professional skier, filming with Warren Miller Entertainment for 25 years, and traveling the globe guiding clients and coaching at camps. He’s also produced documentaries, written for magazines, worked in television, and co-authored a guidebook. Now Anthony is focusing his energy on giving the next generation of kids the same motivation that got him off on the right road. Chris Anthony’s Youth Initiatives Project brings real-life learning moments into the classroom, and also aims to connect motivated kids to educational opportunities in arts, athletics, or academics through a scholarship program. For 16 years, Anthony has been bringing such experiences into classrooms across the country. It started as a way to get kids excited to ski through Colorado Ski Country’s 5th Grade Passport Program, which gives fifth-graders 60 free ski days as a way to introduce them to skiing and snowboarding. 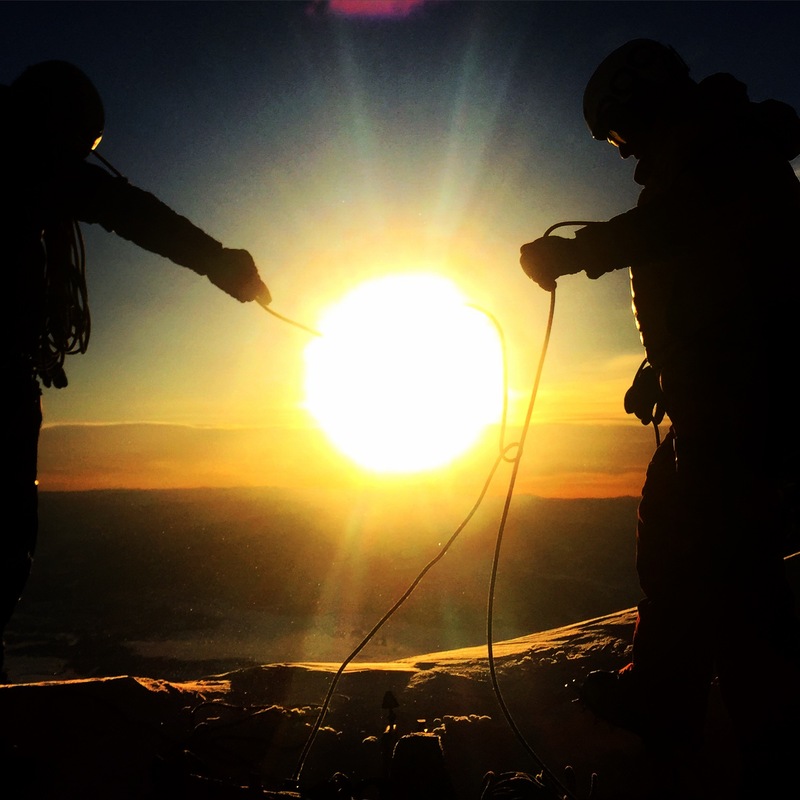 “The collateral effect of that was when I went in and shared the stories and the excitement through using clips out of Warren Miller films; it turns out there are a lot of very teachable moments in those clips,” Anthony says. When his role with Colorado Ski Country was phased out, Anthony continued to give presentations at schools, working them into the Warren Miller Entertainment film tours, absorbing any costs himself. In September 2013, he received 501(c) tax-exempt status as a nonprofit, and decided to expand the mission of his youth initiatives, including adding the scholarship program. Anthony is also expanding the program’s network of mentors through a circle of influential friends. 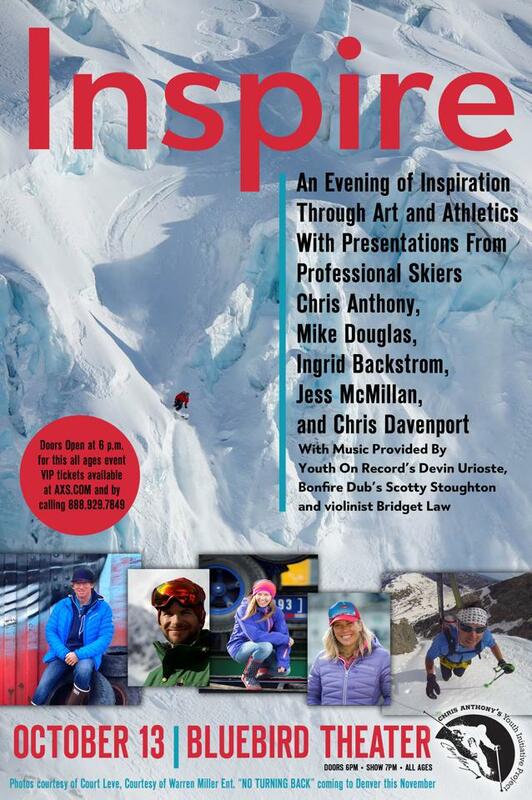 At the program’s annual fundraiser in Denver on October 13, fellow pro skiers Chris Davenport, Mike Douglas, Ingrid Backstrom, and Jess McMillan volunteered to give presentations. Anthony is also working with musicians such as Scott Stoughton of Bonfire Dub and Liza Oxnard, best known around Colorado as the former frontwoman for Zuba. As the foundation grows, Anthony plans to continue to visit schools in hopes of inspiring the next generation to chase their goals. He encourages parents and teachers to reach out, because those are the people who usually initiate a visit, rather than the institutions themselves. To learn more about Chris Anthony’s Youth Initiatives Project, request a visit, or donate, visit his website.